Ahhh, a day to myself. That always means scrap time. I didn't plan on creating this page today. I was looking for some other photos and came across this one of my son in the tree. As I was looking through this paper pack, I saw the large tree sticker on the page. 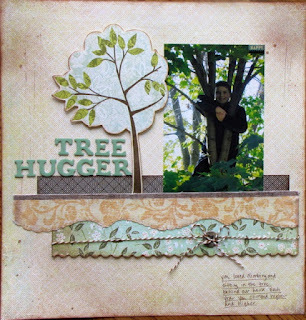 Club Ck May/June Issue Challenge #8 is using a tree element on your page. Since it accidentally fell onto my desk, I went ahead with it. Let me tell you, it is not what I had planned on for this challenge. None the less, I am very happy with the way it looks. I like the subtle colors and the simple design. I probably never would have used this sticker if it wasn't for this challenge. Thanks again CK for pushing me outside my box. How cute is that?!? I adore that photo and what a good idea for a title. 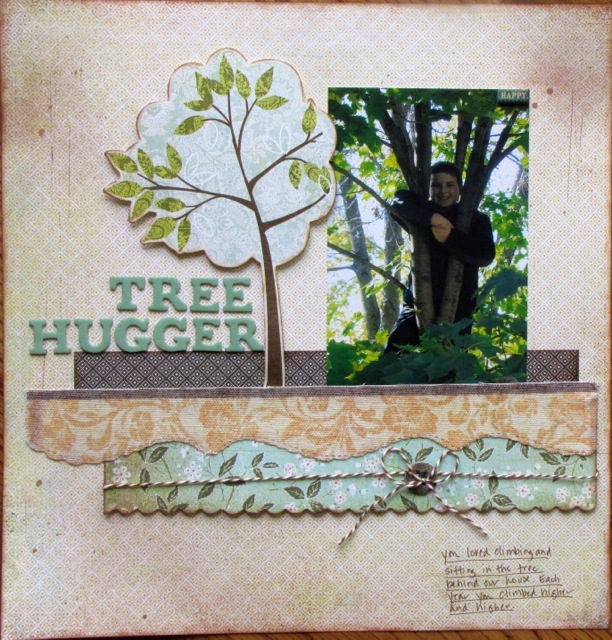 A gorgeous layout...love how everything fell into place for this challenge! I really like how simple this is, but very sharp looking! Love it! Adorable! Perfect for the challenge!